Why ePortfolio? To show and tell the story of your learning. Live your learning. Share your learning. This is SLCC’s help site for students who have chosen Jimdo to build their General Education ePortfolio. The help site was built using free standard Jimdo features and services that you can use for your ePortfolio. 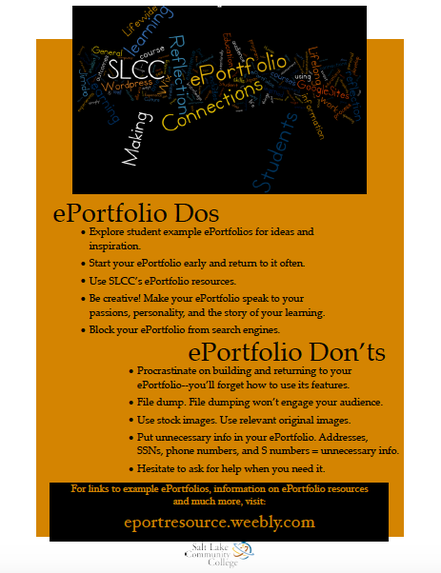 SLCC students are now building fantastic General Education ePortfolios. Jimdo is one dynamic digital space in which you can build your ePortfolio. ePortfolios can help you step ahead by providing a space to showcase, reflect upon, and share your best work with faculty, scholarship committees, potential employers, or any other relevant audiences. ePortfolios can be used to show and tell the story of your academic career in its entirety. As you can see from the menu above, this site has video tutorials to get you started, advice and tips for your ePortfolio, examples of strong ePortfolios, and information where and when to get additional help. NOTE: If you have not watched the "ePortfolio Introductory" video, now would be a good time to watch it. You will find an overview of the benefits and drawbacks of using Jimdo below this exciting video.